After a tough draw the day after Boxing Day to Wolves, I was fairly dejected about Arsenal's standing. They had failed to capitalize on teams like Chelsea and Liverpool dropping points the day before. But now, what do you know, even more teams dropped even more points this weekend, while Arsenal picked up all three. Manchester United lost, at home, to Blackbrun Rovers (Steve Kean in!) Manchester City lost in the 93rd minute to Sunderland. Chelsea lost, at home, to Aston Villa. And to top it all off, Spurs dropped points in Swansea. The season has reached its halfway point; everybody has played everybody else once (except for Spurs v. Everton, which will be made up next week.) For everything that happened in August and September to this team, the season is half over, and Arsenal are sitting in a Champions League spot. Sole possession of fourth place, for a team that was in 17th in mid-September. Not too shabby, all things considered. The second half of the season begins today as Arsenal close a busy holiday period with a trip to West London to face Fulham. It's the last league game until the trip to Swansea in the middle of the month, thanks to FA Cup action next weekend. It's the second game in three days and the third game in seven days for the Gunners, which will likely mean a significant amount of squad rotation. Then again, I said that about the QPR game, and it was a fairly normal XI. So, we'll see what happens. Arsenal have done well to climb back up into fourth place. Now, it's time to stay there. One last thought, but why are Jack Wilshere and Wojciech Szczesny wishing us a Happy New Year together? Happy belated birthday, Jack. No, God, why? Take me instead! Photo: BBC. Part of me seriously considered just leaving that as the squad news section this week, but I feel like I should probably put more thoughts out there. The expected rotation against QPR did not happen, so now I wonder if we should expect rotation now. I mean, I've been wrong once before on this topic, recently. Losing Vermaelen means Arsenal are now without the services of five different defenders for at least a few weeks. Five! Looks like a loan signing is even more necessary *coughnotWayneBridgecough*. The good news is, Francis Coquelin performed well off the bench after Vermaelen was removed. Can he perform well again, is the question. Gervinho was rested against QPR for Andrei Arshavin (who Arsenal fans voted Man of the Match on Twitter, somehow.) Will we see the likes of Tomas Rosicky or Yossi Benayoun get a start? I think both were solid against Wolves, especially Benayoun. 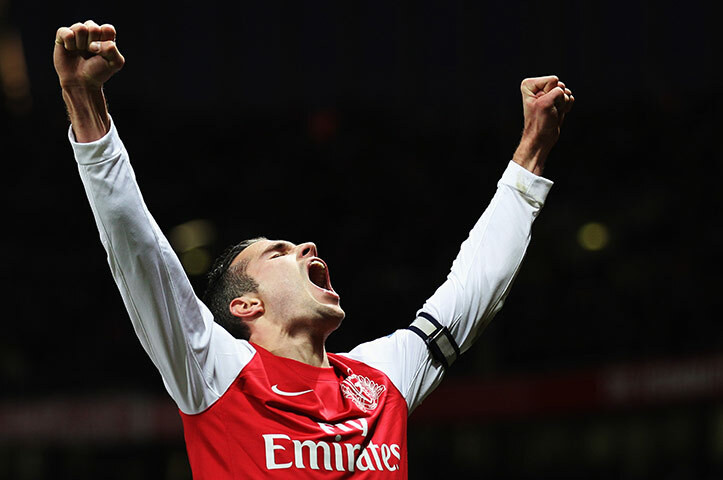 I feel like Mikel Arteta needs a rest, as does Robin van Persie and Aaron Ramsey. Aside from those thoughts, though, I'm not going to try to predict a starting XI. If I had predicted one for the QPR game, I would've been dreadfully wrong, so why try for this one? Also, Thierry Henry is coming back. You probably know that already. the opener against Norwich. Photo: Guardian. Fulham are likely to be without Bobby Zamora, as he nurses an Achilles injury. There is no return date set for him, yet, though it should be soon. Andrew Johnson, with a groin injury, is also listed as unlikely to feature. In good news for the Cottagers, Damien Duff, returning from a calf injury, made a cameo appearance off the bench against Norwich at the weekend. Australian goalkeeper and former Arsenal-transfer-target-saga-subject Mark Schwarzer is out with a back injury until later this month. David Stockdale is deputizing. Simon Davies is also out with a back injury, while Zdenek Grygera is out for the season with a knee injury. It should be noted that while Arsenal will probably have to rotate their squad because they're playing their second game in three days, Fulham are playing their second game in three days, too. on Saturday. Not shown: him hugging Almunia. Arsenal have lost just once in their last 12 league games, though they have dropped points in three out of their last seven, a run that started with a home draw against Fulham. The Gunners have won four of their last five road games in the league, the only blemish being the 1-0 loss at Manchester City. Only the 4-0 win over Wigan in that stretch, though, was a clean sheet. They conceded one at Aston Villa and won, they conceded one at Norwich and won, and they conceded three at Chelsea and won. Arsenal have a solid record around the New Year. The last time the Gunners lost the first league game of a calendar year (which, admittedly, means very little) was 2001, when Arsenal lost on New Year's Day 1-0 at Charlton Athletic. That was Charlton's first win over Arsenal in 44 years. But, that's completely irrelevant to today's game. Fulham have picked up draws in their other two holiday fixtures, against Chelsea and against Norwich at the weekend. Fulham led late, but Norwich got an equalizer from a header in the 94th minute in the final action of the game. The Cottagers have a nasty habit of conceding late goals; they've conceded in the 88th minute or later in nine of their last 20 matches. That does not include Thomas Vermaelen's equalizer for Arsenal against Fulham in November; that goal came in the 82nd minute. Fulham have won three, lost three, and drawn three matches at home so far this year. They held Manchester City to a 2-2 draw, but were thumped 5-0 by Manchester United. They've beaten Liverpool at home, but drew Blackburn. They thrashed QPR 6-0 on home soil and also beat bottom-placed Bolton. There have been 50 all-time meetings between Arsenal and Fulham, across all competitions; Fulham have won just seven of them (that's 14%.) I actually did that math before realizing I could just multiply seven by two. All seven of Fulham's wins against Arsenal have come with Fulham as the home side, as they are today. Fulham's most recent victory against Arsenal came early in the 2008/2009 season. Fulham have managed a draw in each of the last two meetings between these sides. 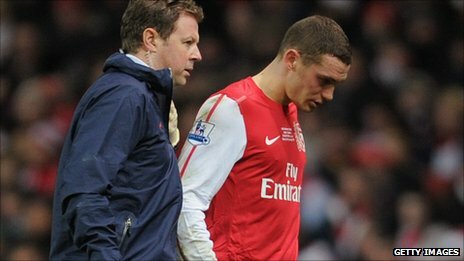 Just five weeks ago at the Emirates, in the reverse fixture, Fulham took a 1-0 lead from a Thomas Vermaelen own goal. The Belgian rectified the situation by scoring Arsenal's equalizer, but there would be no winner from either side, as both the Gunners and Cottagers split points. This fixture last year was the final match of the season. Arsenal came from behind twice to gain a point, ending what was a terrible finish to the season for the Gunners. It was Theo Walcott's goal in the 89th minute that made the result 2-2, but at that time, after going through so much from the Carling Cup Final on, so little of it felt like it even mattered. That draw snapped a three match winning streak for Arsenal against the Cottagers. we can all agree with. Photo: AOL. The referee is Gloucestershire-based Lee Probert, working his second Arsenal match of the season. The first was the Carling Cup loss to Manchester City, which came three days after the reverse of this Arsenal/Fulham fixture (that last bit is completely irrelevant, thank you.) Probert only worked two Arsenal matches last year: the Carling Cup extra time win at Tottenham, which saw Probert award Arsenal two penalties in the opening five minutes of extra time, and the 2-2 draw at Wigan that saw a Sebastien Squillaci own goal throw away two points. Probert has taken charge of only one Fulham match this season, a 3-1 home loss to Everton on October 23. Lee Probert, across all competitions, has shown only three red cards this season, and none of them have been in domestic matches. Both came in Europa League group stage matches: one to AEK Athens in a 2-1 loss to Sturm Graz and two to Paris St. Germain in a 0-0 draw with Slovan Bratislava. 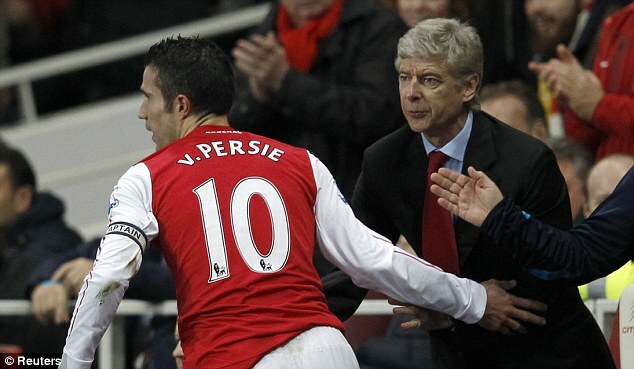 It should be noted that in August of 2009, when Mike Dean famously sent off Arsene Wenger for kicking a water bottle at Old Trafford, he did so on the advice of Lee Probert, who was the fourth official. Trafford in the reverse fixture. Photo: Guardian. Arsenal's match with Fulham is the late game today, the last of five games played on the docket. The remaining five matches in this round of fixtures will be held over the course of Tuesday and Wednesday. Four matches kick-off at 10:00 a.m. Eastern time today: the biggest match sees Chelsea travel to the Black Country to face Wolves at Molineux. Meanwhile, Aston Villa hosts Swansea in Birmingham, Blackburn Rovers welcome Stoke City to Steve Kean Out Park, and QPR host Norwich at Loftus Road. Three matches on the slate tomorrow, all in prime-time in England (so, afternoon here in the States), as Spurs host West Brom, Wigan hosts Sunderland, and in the biggest match of this round, Manchester City welcomes Liverpool to Eastlands. On Wednesday, Newcastle welcomes Manchester United to Mike Ashley Is Great Stadium at St. James' Park, while Everton hosts Bolton at Goodison. These are the reverse fixtures of those played on November 26-27.